What Happens to Stocks and Bonds When the Fed Raises Rates? Now that the economic data is picking up, investors will turn their attention to the what the Fed will do with short-term interest rates. People have been contemplating when the Fed will raise rates for some time, but improving employment numbers and GDP growth have really ramped up the speculation on that first rate hike. Because interest rates play such an important role in the economy and the markets, investors are concerned with what will happen to stocks and bonds once the Fed finally makes its move to tighten monetary policy. This concern makes sense from a textbook standpoint — rising rates hurt bond performance and increase the cost of borrowing for corporations, among other things. You can see the Fed has raised rates on many occasions in the past, which gives us plenty of opportunities to see the historical impact on the markets. I looked back at all of the biggest rate hikes included in this time frame to see what happened to both stocks and corporate bonds from the time the Fed started raising rates until rates peaked. The track record for stocks doesn’t look too bad. Only two down periods out of fourteen of the biggest rate increases and the worst one included one of the worst bear markets of all-time (1973-74). These are total returns, but the average annualized return for the S&P 500 was actually right at the long-term average of around 10% per year. Bonds lost money half the time, which makes sense as bond prices and interest rates are inversely related. This is why bond investors have been preparing for a rise in rates for some time now, even though it just hasn’t happened yet. There were also some interesting historical market events that occured just after these Fed rate increases ended. Rates peaked just before the 1987 Black Monday crash as well as at the beginning of the 2000-2002 bear market. And the 2007 rate hike ended just before things started to get interesting in the most recent crisis. On average, things look pretty good. But there’s a wide range in the performance numbers, even going out to the five year mark. Bond returns post-rate hike were juiced from higher yields and the fact that the Fed then reduced rates yet again. 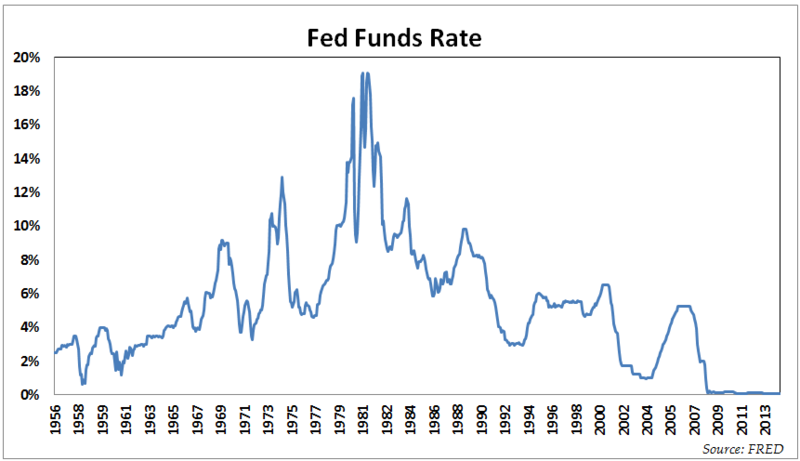 You can see from the graph of historical rates from above that there are plenty of peaks and then rates are quickly lowered again. The usual caveats apply here — starting valuations, interest rates, trends, sentiment and a whole host of other factors have to be taken into account for today’s markets along with any of the historical data. Also, the total returns for bonds following most of these rate increases were so huge because the bond yields were so high before they started raising rates. That’s not the case today. The experience in 1950s and 1960s makes much more sense as a historical precedent for today’s bond environment than the 1970s, 80s, 90s or 00s. And as usual, the markets don’t have to react a certain way just because they did so in the past. But so many investors are absolutely certain stocks and bonds are both going to get killed once the Fed finally does decide to raise rates. The historical record doesn’t clearly back up that argument. It’s never going to be that easy. It’s unfortunate that Ibbotson chose to use long corporate bonds (specifically, the Citigroup Long-Term High Grade Corporate Bond Index, stated to have approximately 20 years maturity) instead of intermediate term bonds. Returns of his 5-year and 20-year government bond series were nearly identical, but the 20-year series was of course more volatile. Presumably a 5-year corporate bond series would exhibit the same pattern compared to long corporates: nearly the same geometric return, but less volatility, and thus less interest rate sensitivity. Barclays Aggregate bond index goes back to 1976, but it started as a mix of Treasuries and corporates. The Dow Jones Corporate Bond index, though not very well diversified and somewhat arbitrary in selection, has a long back history and appears to have been, based on its volatility, of intermediate duration (say 5 to 10 years) usually. I agree with you on the bond data. The only thing I have on a monthly basis going back very far is long bonds. I do have 10 yr treasuries going back to the 20s but its only annual returns. It seems all of the best indexes only go back to the mid-1970s so the historical data is mostly a waste if you want to see a rising rate environment. 5 year bonds would be great and everything I’ve read says that’s the sweet spot. I’ll see what I can dig up from a few of my sources. Nice post!. It would be interesting, also, to see the real returns for these time periods, as it’s purchasing power that really matters. The high inflation of the 70’s and early 80’s crushed real returns. That’s a good point and something I thought about. For a back of the envelope calculation, inflation averaged 7.1% in the 70s and 5.5% in the 80s to get a sense of those real returns. Can you point me to any research or general insight that can help explain whether the rising rate consequences are any different when going from 0% to X% than they are for an equivalent move say from 3% to X%? Same size increase but from a different starting place. From the FRED data, it looks like going back to the 0.63% of 1958 is as low as we can find to replicate an increasing rate environment that is similar to today’s off-the-floor scenario. Not sure that precedent from 1958 remains valid however. Not that any precedent really tells us much about the future. Thanks for your posts. From their chart you can see that trouble in the past didn’t start until around 5% in rates. Like you said, a much lower starting poinrt now, but interesting nonetheless. Ben – Saw this article picked up in the WSJ over the weekend. Congrats. 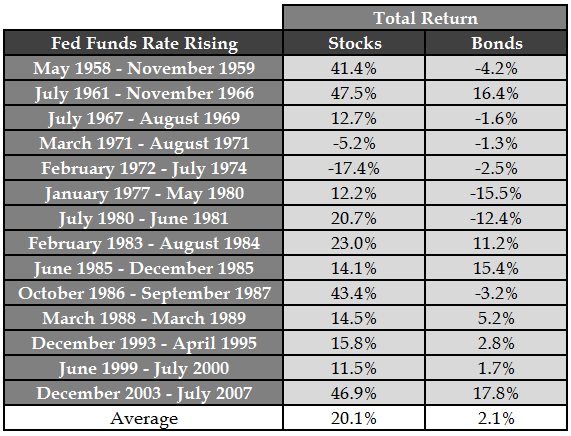 In it it states that the average annual return for the S&P 500 during all 14 periods was 9.6%. Trying to replicate off your numbers and get annualized return slightly north of 12%. How did you get the annual annualized return of 9.6%? Ben, do you have a value of rate rise during that periods? It will be interesting to compare it with return of assets.